Manual or Automatic – Whats the Difference? For automatic standby power, there are a few options – new construction allows for the option of a Generator Ready panel that allows the generator to be installed and purchased at a later time without costly retrofit transfer switch installations. These panels are specific to certain brands of generators, so please call if you have questions. Wording can be a bit tricky too – many sites and ads use the term ‘whole home backup’. While this can certainly happen if desired, we need to make sure that the correct size generator is purchased. 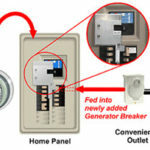 For example, most new(er) homes are at least 200 amp services, now the load being used by the whole house may not be more than 150 amps at any given time, but a 22kW generator will calculate to a maximum load of 91.67 amps. Then you need to pay attention to conitnuous load items like AC units or heat pumps (take a moment to search for load shedding if researching generator options). Summary: take the time to do your homework and make sure you get what you are expecting!